Egypt Air is showing some flights from Toronto to Cairo, Egypt (CAI) for a ridiculous price of $548 roundtrip including taxes. (Some are showing up at $566). The flights are non-stop each way. At the moment, these are only showing up on some smaller third-party booking sites, which can be a sign of a mistake price. So, if you do book this, wait at least 24 hours until after the dust settles before booking anything else (hotels, etc). Keep the expectations low while waiting to make sure the ticket is issued by the airline. In situations like these it usually becomes clear within 12-24 hours whether the airline will be issuing the tickets or not. And the #1 rule in a situation like this, do *not* call any booking agencies to help you book it. They will not be able to book it over the phone, and there is no upside to calling. You'll need to book it online to have any chance. To book it, click through from Kayak to either Travelgenio or Travel2be or Tripsta or eDreams. I really couldn't tell you which one of these booking sites will be your best shot at issuing a ticket in this situation. None of them are really ideal for this sort of thing. eDreams would maybe be my pick, just by virtue of them being the largest of the 4 agencies and perhaps the best chance of having a ticket issued quickly enough. Although TravelGenio is actually pretty big too, just not in Canada (1 million bookings worldwide in 2014). If another booking agency pops up with these prices I'll update this post. UPDATE 1: These are showing up on Egypt Air's own website...sort of. 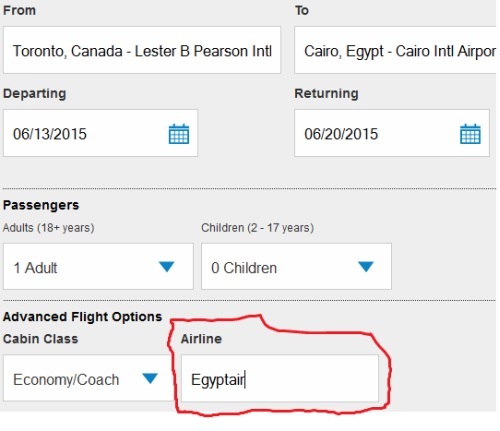 If you go to EgyptAir.com and click on the country name and change it to Egypt, and search for June 13-20 it will return a result of around 3400 Egyptian Pounds, which is approximately $550 Canadian. However, if you try changing the country to Canada, and search in Canadian dollars, it does not show the cheap price. - Thanks to Ephrem for discovering that! UPDATE 2: They also appear to be showing up as 298 British Pounds on EgyptAir.com, which is $555 CAD. TravelGenio and eDreams are based in Europe. Guessing it's not a coincidence. 438 Euros if you search using Spain. Works out to $548 CAD. UPDATE 3: So now I'm thinking your best shot is probably to book it through EgyptAir.com directly - but in a different currency (Euros or Pounds). Your credit card will likely charge an extra 3% for the currency conversion, but booking directly through the airline website usually offers the best chance in mistake fare situations. The payment page on EgyptAir.com shows that they accept Mastercard, Visa, or American Express. UPDATE 4: Other cities that have dropped in price on EgyptAir.com as a result of this.... currency error? ^^ These other cities may only work on certain dates. June 01 - 08 is an example of one that seems to work for most of them. You still need to search in an alternate currency besides dollars. British Pounds seems to work well. Also note that Egypt Air is a dry airline (no alcohol). UPDATE 6 - May 8 @ 10:28 AM EST - These are now showing up as being bookable through Priceline.com for $453 USD, which will work out to about $560 CAD when charged to a Canadian credit card. UPDATE 7 - May 8 @ 10:36 AM EST - Egypt Air is now advertising this as a genuine sale (see very bottom of the EgyptAir.com website), so there should be no worries about tickets being issued. Egypt Air has said this offer will be valid until May 13, or until seats sell out, whichever comes first. 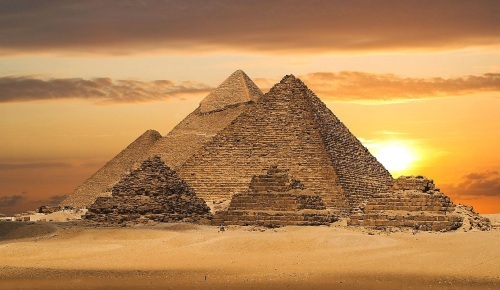 toronto, yyz, flight deals, africa, northern africa, cairo, egypt, cai and egypt air. 8 Responses to "Toronto to Cairo, Egypt | $548 roundtrip including taxes"
woohoo! sweet deal.... just booked. thank you for finding that one!!! I thought Egypt is not very safe right now... aren't you guys worried? I just tried to get my friend to go with me and do a Gadventure tour but nope, she won't budge... so saaad! My friend Anna is insane! There's a government warning not to go to Egypt, and its going to be a bazillion degrees in July!! Dudes! Egypt is cool man! If you're pure of heart, no evil will touch you. Just go, chill out, see some pyramids, smoke some shisha. You'll be fine! Statistically speaking, your drive to work every morning is the most dangerous thing you'll likely ever do in your life. Don't worry about conditions in Egypt. They are desperate for tourists and treat you like returning family. If you're not a city person, you should bone up on street safety and pick pockets, a fact of life in many cities. Just go!